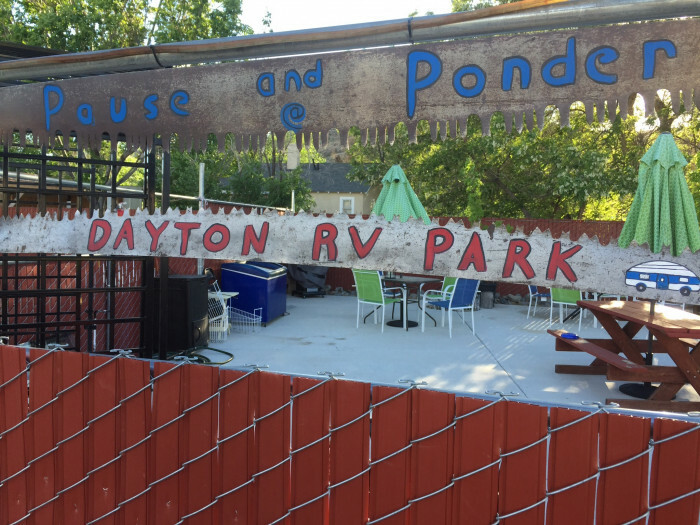 Ask fellow campers about "Dayton RV Park" and nearby attractions. Easy to get to off the highway turning off 50 onto Pike. Paved interior roads and concrete sites. Can be tight getting around but we had help to move a car and we made it. Utilities worked well. Wifi was good enough. Not enough room to park our 5th wheel and truck in site so parked truck in an auxiliary parking row. Hot bathroom in cold weather. Sites are very close but level with artificial turf between. Rate was taking advantage of a buy two nights get one free special. We camped at Dayton RV Park in a Fifth Wheel. About 11 miles to downtown Carson City. Watch your speed between Carson City and Dayton as the speed limit goes up and down several times and we saw people pulled over. This park is very well organized and clean. The spaces are fairly close together but you will be able to put your slide out. We couldn't extend out awning out completely. The site are all very level. and I had room for my F-250 truck and trailer in our space. The Wife used the showers on site and gave her approval. WiFi was slow, but I'm guessing that people were downloading movies which slows down wifi service in any park. That's why I have my own hot spot to give me fast and secure internet service. Verizon Service was excellent. We stayed for three nights and would return. 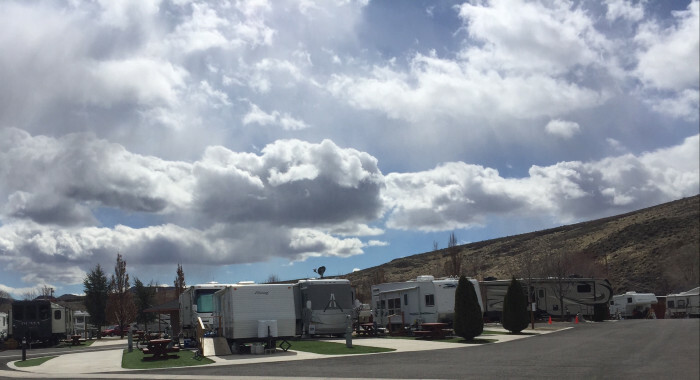 We camped at Dayton RV Park in a Travel Trailer. 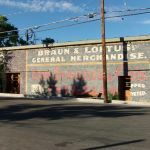 This is a great location for day trips to Carson City, Virginia City and Lake Tahoe. There is a Smith's (Kroger) Supermarket in town plus a 2 Walmarts and a Costco in Carson City. 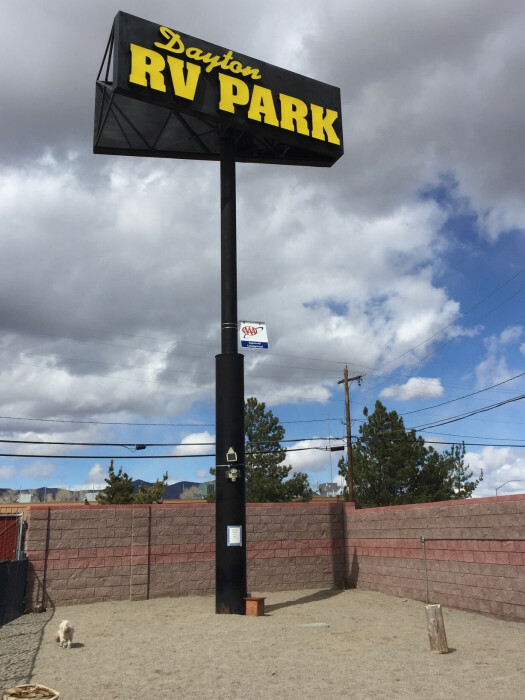 It is with heavy heart that we leave Dayton RV Park. We have spent the last 3 1/2 months there and have loved it. The owner and manager are doing an excellent job improving the park, keeping it clean and serviced. It's a nice small community where everyone helps each other. We shall miss all our dear friends at Dayton RV Park. Hopefully we will return soon. We camped at Dayton RV Park in a Motorhome. Close to Carson City, Virginia City, Tahoe and Reno. Lots of interesting sites in area. 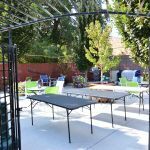 Walking distance to restaurants and Family Dollar. Donna,thank you for the nice review. We will miss you and Martin, We do have a nice family atmosphere at the park, mainly because of folks like you and Martin, We will be thinking of you on The holiday tomorrow.Thank you for all your help with the painting, exercise class, etc!! Bathrooms were cleaned very infrequently and the heat was off. The manager is rude and treats women with disrespect. They charge obscene amounts for electricity. We camped at Dayton RV Park in a Fifth Wheel. 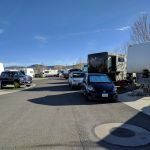 Cathy, thank you for your review, I know your up set , as I had to ask you to leave the park, for non payment of rent, bounced checks and for being harassing the other campers. Bath rooms are cleaned every day, as you know. Cathy it is not nice to writer lies, to avoid your issues. Small park located behind the Casino in Dayton. We spent 5 nights visiting my sister. Sites are VERY close and parking is difficult. Only 3 OTA channels, so we paid the $50 deposited for a cable box. Over 100 channels that way. Very clean with very friendly owners. Plan to stay here again someday. 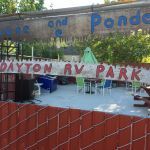 We camped at Dayton RV Park in a Travel Trailer. So glad you enjoyed your stay at the Dayton RV Park! Come back again soon... perhaps during one of the local events! Great level space with artificial turf. Super nice owners, clean beyond clean. Simply a great place. 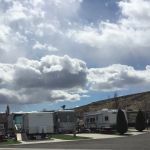 We camped at Dayton RV Park in a Travel Trailer. Thank you for the great review! Cleanliness is next to Godliness! Come again soon! We are working on the bathrooms this winter, new laundry machines coming next month and bbq's in the Spring! Managers are a pleasure to deal with and actually the reason we returned here. Spaces are pretty close but very neat and clean. Showers,laundry and restrooms are very clean. Rated the value at only 4stars because there is no pool, jacuzzi,or fitness center. Wifi is great. Very helpful people. We camped at Dayton RV Park in a Motorhome. Quite close to Virginia City. Easy access to Hwy 50. Thank you so much for your kind review. I know, a pool and jacuzzi would be fun, but this location just did not lend itself to those amenities. Lake Tahoe isn't too far for a dip! Glad you enjoyed our upgraded WIFI too! Come again soon! This is a small, clean park. Very friendly, helpful manager. The park is easy in/out from Hwy 50. Paved roads and concrete pads, no grass but have artificial turf and sand. Sites are very close. Utilities are fine. Fenced in dog park all sand. Walked our dog across the street at local Casino that has grass. We stayed 2 nights to visit Virginia City which is about 8 miles away. We stayed here in a 43' motorhome on site #30 which is a double front to front facing site right at the entrance. We had the site all to ourselves which made easy pulling and exit. We would consider staying here again if in the area. We camped at Dayton RV Park in a Motorhome. This is a great RV park but just not our style. The hosts are very pleasant and helpful, the grounds are in immaculate shape and the showers & laundry facilities are super clean. Two trees at our site had branches that needed trimming back. After guiding us to our site, the host immediately came back with loppers and trimmed the branches. One day, the shower hot water was out. The host immediately went over and found the wind had blown out the water heater pilot light. Hot water was restored within 15 minutes. The only downsides for us is that the sites are very close and tight. We could almost "pass the Grey Poupon" between the rigs next to us. Also, about 80% of the park is permanents or semi-permanents. All the rigs are in good condition and there aren't any eyesores but we're not fans of such parks. We camped at Dayton RV Park in a Motorhome. Price is based on weekly stay (50 amp). This place is a little gem. Grounds are immaculate. Interior roadways are almost new asphalt, sites are level cement. No grass, astro turf is used. Picnic table at every site. Individual sites are a little close to each other. Really nice owners. Owner takes you to your site. Electric was fine. Good water pressure. 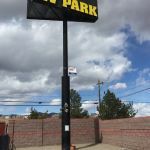 Elevation is approx 4,500 ft. Owners have a added a nice patio area with tables, awnings, and chairs and two large gas BBQs. I will be back. One negative - Very little shade. We camped at Dayton RV Park in a Fifth Wheel. Close to Virginia City and Carson City. We stayed 11 days and had a rate discount to @$28. Very friendly couple live on site and keep this camp pristine. Liked the artificial turf to step out on. Liked the economical coin operated laundromat. Liked this quiet location. Great for walking dog on nearby BLM land or state park. A quick walk to town, Dollar store around the corner and major grocery/shopping just two miles north. We used the propane BBQ that is located in an inviting small garden/patio corner. Manager gave us a free night after some sewer hookup issues. We will always stay here when visiting family in Dayton. We camped at Dayton RV Park in a Motorhome. 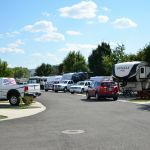 Are you affiliated with Dayton RV Park ?